Usually when I see any type of gaming event offering extra XP it grabs my attention and I just have to know more. And usually when I see something about Elder Scrolls Online I stop and have to read it thoroughly. Combine Elder Scrolls Online with an even offering extra XP and I’m sold. 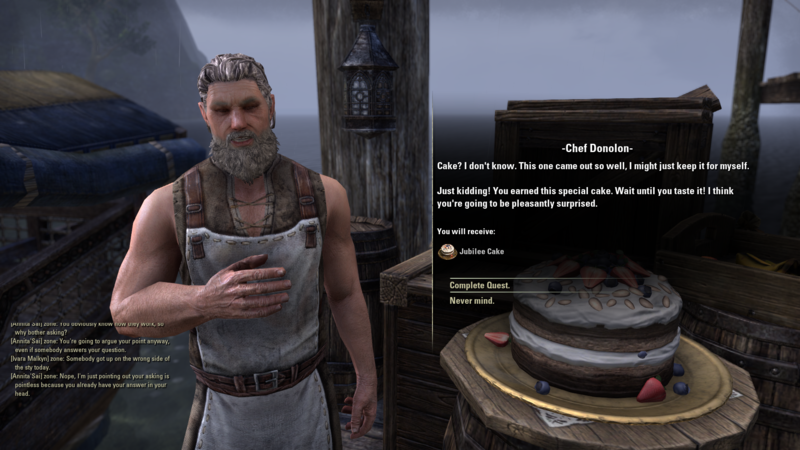 Such is the case with Elder Scrolls Online 2nd Anniversary Event offering 100% XP bonus starting now until 8pm EDT on April 12th. So if you’ve been grinding to level up for some time, exploring some of the latest DLC or it’s been a while since you’ve played you might want to take advantage of this opportunity. 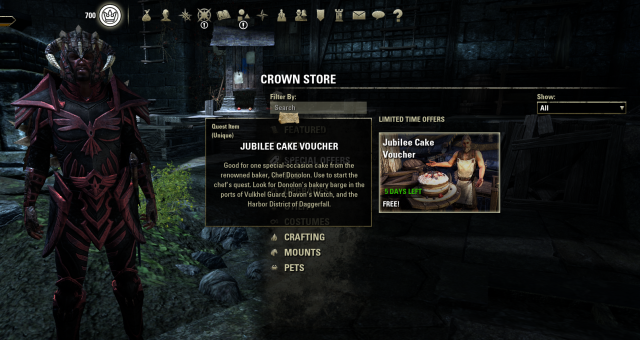 It’s a buff available for everyone called the Jubilee Cake that will apply 100% extra XP to you or your group. Complete the quest “Ache for Cake” to claim your Jubilee Cake. The Ache for Cake quest isn’t complicated but does require you to venture around to complete it. You have to find Chef Donolon and collect some ingredients for him. He can be found in the ports of Vulkhel Guard, Davon’s Watch and the Harbor District of Daggerfall. The easiest way to do this is to use a wayshrine to fast travel to Glenumbra and then travel to the harbor. He’ll tell you to collect the ingredients, such as honey, and you might already have them in your inventory. If not you can just go to a grocer and buy them easily. Once you return to him you’ll give you the Jubilee Cake and it’ll be added to your Collections under Mementos. The buff only lasts for 2 hours but you can keep reusing the cake as often as you want until April 12th at 8pm. Once the event ends the cake will be nothing more than a memento but it’ll be a good one reminding you of how much you leveled up during this 2 year anniversary event.